If you want a really simple, easy, quick (weeknight!) 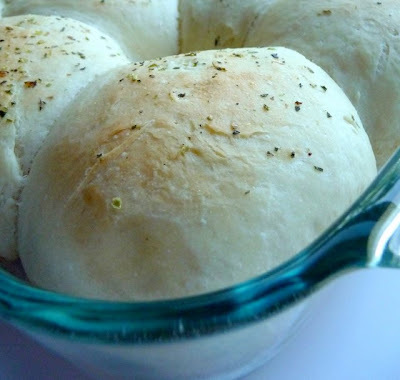 dinner roll – this recipe is perfect. That is exactly what I was looking for when I made skillet pasta puttanesca. I made these when I first got home from work – and by the time I had dinner ready – these were ready too. 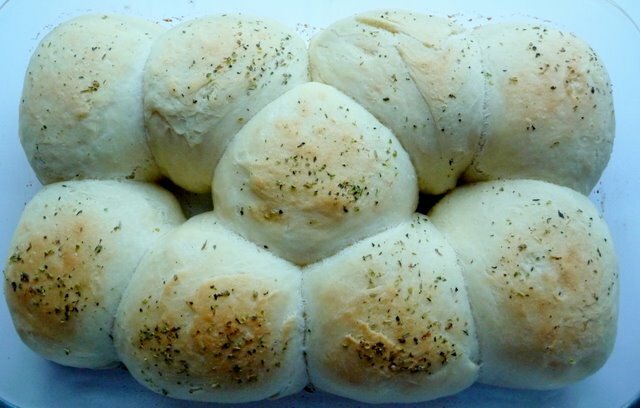 There is something magical about a fresh baked dinner roll. Enjoy! 1. In the bowl of a stand mixer, stir together warm water, yeast, and sugar. Let stand until creamy, about 5 minutes. 2. To the yeast mixture, add the oil, salt, and 2 cups of the flour - on low speed with the paddle attachment incorporate the flour to create a wet, sticky mixture. Still on low speed, add 1 cup of the remaining flour and incorporate. 3. Switch to the dough hook and add the remaining 1 cup flour. On low speed, mix the dough to incorporate the final addition of flour until the dough has pulled away from the sides of the bowl. 4. Turn the speed to medium and knead until smooth and elastic, about 5 minutes. 5. Lightly oil a large bowl and place the dough in the bowl - turn to coat. Cover the bowl with plastic wrap and let rise in a warm place until doubled in volume, about 20 -30 minutes. 6. Turn the dough out onto a lightly floured surface and gently deflate into a rectangle. Cut it in half vertically, then each half vertically again into thirds so you have 6 equal strips of dough. Cut each strip of dough into fourths by cutting horizontally to make 24 little squares of dough. 7. Take each piece of dough and cup it lightly under the palm of your hand on a clean surface. Press lightly and start rotating and rolling the dough ball quickly so that it forms a nice little ball of dough. 8. Place each piece of dough into a lightly greased 9x13 baking pan in rows of 4 about 1/2-inch apart. 9. Cover the rolls in the pan with a lightly greased piece of plastic wrap and let rise to double while your oven is preheating to 400 degrees F, about 20 minutes. 10. If you want an even more golden color to the rolls, brush them with a little melted butter and italian seasoning before baking. 11. Bake for 13-15 minutes in the preheated oven, or until golden brown.